Welcome to the Commercial Penthouse at the Stonecutter Lofts. This one-of-a-kind space is simply a work of art carved from a 100 year old factory. Features include 10′ & 20′ exposed wood beam ceilings, sandblasted brick walls, radiant heated floors, 4,400 sq.ft. of interior space, and 3,000 sq.ft. of outdoor living space. Stonecutter Lofts at 43 Britain Street is a true gem of a loft conversion, safely tucked away on a peaceful street, yet only steps from Queen and Jarvis. 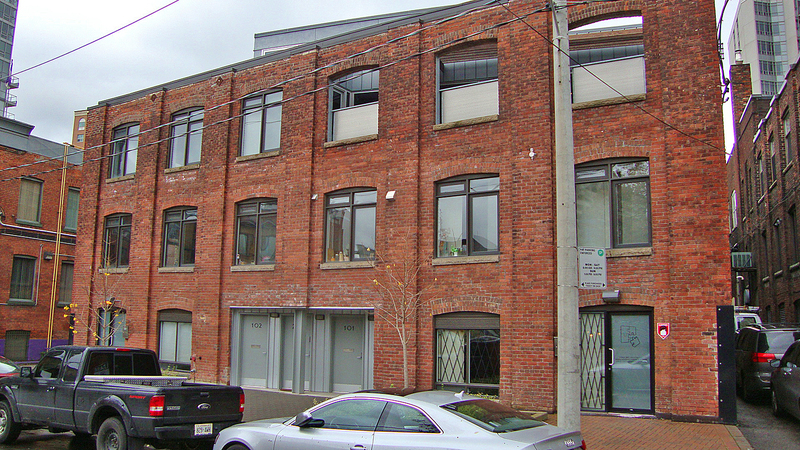 Though its namesake is the old Stonecutter Arms pub of Britain Street, the Toronto lofts building itself was converted from a warehouse just behind the pub, and was built over a century ago. Completed in 2005, this lovely building features classic post and beam construction, complete with exposed brick and beautiful hardwood flooring. High ceilings are accented by large open areas, and several of this building’s suites feature unique design and planning, tailored to suit the original buyers of these units. The location is ideal – set well off the beaten track on Britain Street, peace and quiet is yours to enjoy. If you should tire of the tranquility, you are a short walk from work and lunch dates in the Financial District, while the fresh produce, variety of bulk foods, and local meats and cheeses of St. Lawrence Market are not far away. Your neighbourhood, King East, is well-known for high-end designer furniture, while the restaurant scene is quickly becoming a lesson in dining at its finest. This combination of attractions creates an atmosphere which attracts “all the right people,” and you have the opportunity to blend right in or stand out in the crowd as you enjoy the loft-lifestyle, whether sampling some of Toronto’s top cuisine, or dancing at the exclusive Reservoir Lounge. This brilliant property has been right under your nose for years – it’s time to discover this lovely Toronto loft conversion! If you would like further information about this property, or if you would like to arrange a viewing at a convenient time, please contact me. I look forward to hearing from you. Helping you is what I do..